“You get an E for effort and an F for fracking it up”. That just about sums it up. I was a big fan of the mid-2000s Battlestar Galactica reboot and its sister series Caprica, but had somehow overlooked this pilot for a second prequel spinoff. Belatedly seeing it now, the plot seems too slight and insubstantial to possibly set the stage for an ongoing series. Not only were BSG and Caprica thematically complex (grappling with war, terror, fanaticism, politics, ethics, artificial intelligence, etc. ), it was also blessed with a knockout cast (especially the volcanic Edward James Olmos), but everyone in Blood & Chrome is as flat and affectless as the greenscreen virtual sets and digital lens flare. 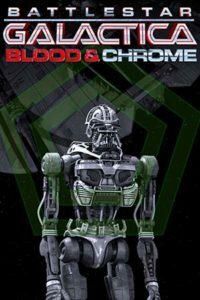 Worse, Blood & Chrome is near-devoid of the big ideas that drove Caprica, which was probably too smart for its own good. The pop culture hill I will die on: Caprica was a smarter show than the similarly-themed Westworld will ever be. Discuss.